There is a good chance that you have read up on the importance of an emergency kit in your car. You may even have read about what items you need to keep in your emergency kit. In fact, you may have read about it here as it is an important topic. But now, more than ever, when the temperature outside gets dangerously cold and the streets are at their absolute worst, you need to make sure you have an emergency kit in your vehicle and that it is well-stocked with the right items. Items that could save your life. As important as it is to keep your vehicle properly serviced and the windshield repaired, you need an appropriate emergency kit. 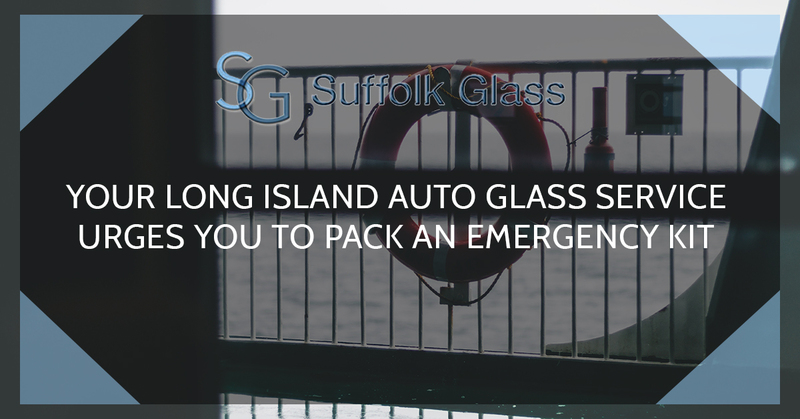 Suffolk Auto Glass of Long Island offers you this list of times you need to have in your emergency kit. You should always have a good set of jumper cables in your car at all times, but especially in the winter. Never assume that should your battery die in the cold at the worst place that the lesson who stops to help you will have a set of jumper cables. What would normally be an easy and quick fix can wind up being a pain if you don’t have jumper cables. In fact, it’s not a bad idea to have two or even three flashlights in your car at any given time. Again, it makes sense to buy quality flashlights that are durable and have LED lighting. Nothing is worse than having an incandescent flashlight with a burned out bulb. We know it is a lot to ask to check your fluid levels every time you head out, so it makes sense to carry extra with you just in case. If your car does overheat, a gallon of antifreeze just might be enough to get you back up and on the road again. With the amount of dirt and grime spitting off tires, you go through a lot of windshield wiper fluid in a vain attempt to keep your windshield clean. Running out of fluid could sideline you. That is, unless you carry an extra gallon in the car. You might just throw on a flimsy coat when you decide to drive to your favorite restaurant for dinner. You are plenty warm in the car, but should you break down or get stuck, that flimsy coat will hardly protect you from the elements. For this reason, you should have extra gloves and a hat stashed away in your emergency kit. Changing a tire or digging out of the snow is so much more comfortable when your hands aren’t freezing and numb. And should you find yourself stranded on the side of the road and having to wait for someone to come get you, a blanket will keep you warm until help arrives. In the winter months, it is best if you are well-prepared. If you are in need of windshield repair or replacement, contact Suffolk Auto Glass today.